Prime lambs are sold at Thainstone every Thursday from 12:00noon starting with the first spring lambs from the beginning of May onwards. The autumn season emphasis is on grass-fed lambs straight off their mothers. Our prime lamb peak season is February, March and April which covers the Easter market. 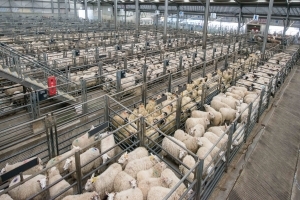 Once supplies dry up further south, buyers are tempted up to Thainstone by weekly entries of between 2,000 and 5,000 prime lambs every week. There is a strong competitive element to the prime sheep business with special shows and sales held throughout the spring starting with a Beltex event in March. The Suffolk sired lambs compete at their own show and sale in May followed by a Texel event in June. A seasonal highlight is the prime lamb pairs competition and sale at the Christmas Classic in early December. Winning pairs are fiercely bid over by butchers looking for something extra special to put in their Christmas counters. Consignors should note that sheep should be properly tagged, as required by the sheep identification regulations.